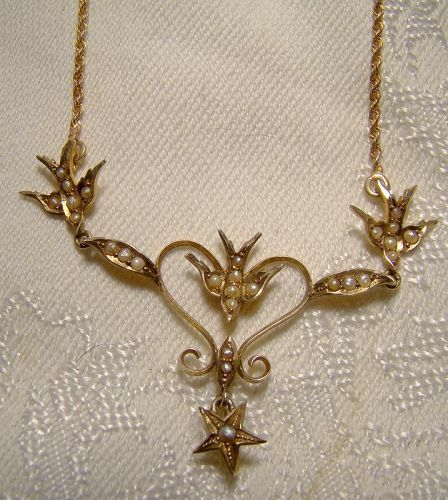 An Edwardian 10k 14k birds and heart seed pearls lavaliere necklace circa 1900 1910. This classy and elegant 18-3/8" necklace features three flying birds, one of which is mounted on a heart with a star suspended from it. The seed pearls spread throughout the 2-1/2 - 1-1/8" central drop are quite attractive and the drop is stamped 10K. 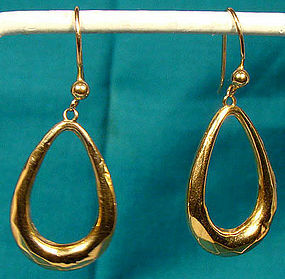 The contemporary rope twist chains are replacements and they are unmarked but test as 14k gold, and they have a barrel clasp. This fine necklace weighs 5.3 grams and it is in excellent condition with no chips, cracks, dents, bends, corrosion, damage or repairs other than the chain replacement. All items are thoroughly and conservatively graded and all condition issues are noted; all items are vintage or antique and may have slight signs of gentle use. Expedited tracked and insured parcel shipping to the U.S. starts at $24 (other spots may vary, air is higher). Items paid with a credit card will be shipped to confirmed addresses only. We do ship internationally. All of our prices are in $US. PLEASE NOTE: We DO NOT accept PayPal. 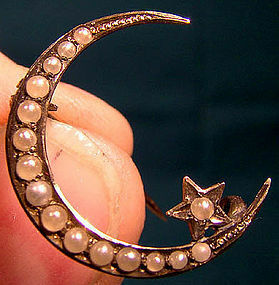 A nice quality Edwardian 13/16 x 3/4" moon and star pin featuring graduated seed pearls c1900-10. 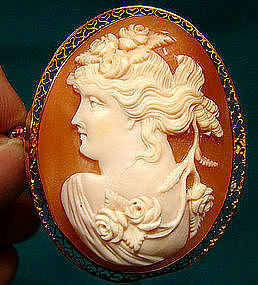 This brooch is stamped 10K, it has the original c-clasp and it weighs 1.4 grams. This item is in excellent condition with no chips, cracks, dents, bends, corrosion, losses, damage or repairs. All items are thoroughly and conservatively graded and all condition issues are noted; all items are vintage or antique and may have slight signs of gentle use. Tracked Packet shipping to the U.S. starts at $16.50 - this includes online tracking, air service and insurance up to $100. Items paid with a credit card will be shipped to confirmed addresses only. We do ship internationally. All of our prices are in $US. PLEASE NOTE: We DO NOT accept PayPal, only VISA and MASTERCARD. 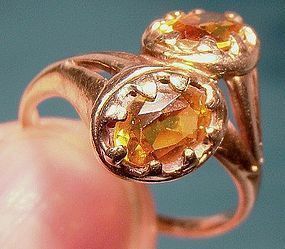 An Edwardian era 10k yellow gold yellow topaz stone ring c1910-20. This size 7-1/2 ring features two oval faceted natural golden yellow colour genuine topaz stones, and the gold has a faint rose gold colour. 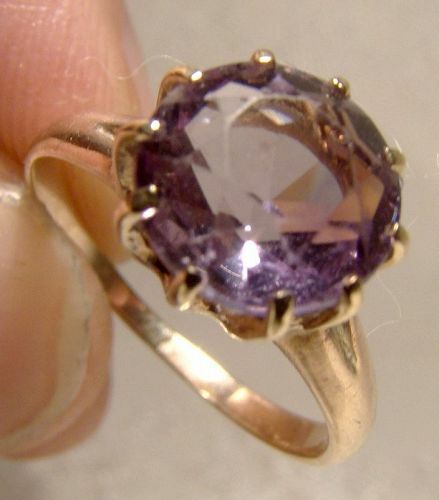 This ring measures 9/16" at its widest, and it is stamped 10K. It weighs 3.6 grams, and it is in excellent condition with no chips, cracks, dents, bends, corrosion, losses, damage or repairs. All items are thoroughly and conservatively graded and all condition issues are noted; all items are vintage or antique and may have slight signs of gentle use. Surface tracked shipping to the U.S. starts at $21 (other spots may vary, air is higher) - tracking and insurance are included in shipping quotes. Items paid with a credit card will be shipped to confirmed addresses only. We do ship internationally. All of our prices are in $US. PLEASE NOTE: we DO NOT accept PayPal, only VISA and MASTERCARD. An ornate vintage Edwardian 15K yellow gold brooch with ruby spinels and diamond. 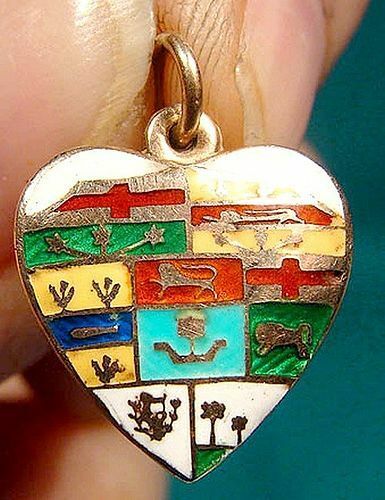 This elegant pin is in an ornate banner or ribbon design, and is fully hallmarked for Birmingham, England 1906. This 1-7/8" x 1/2" brooch features two 4 point genuine ruby spinels and a central 2-1/2 point (by gauge) mine cut genuine diamond. 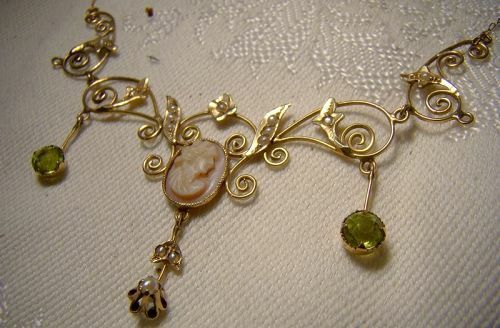 It has wirework and ball decoration and the original c-clasp. It weighs 3.1 grams, and it is in excellent condition with no chips, cracks, dents, bends, corrosion, losses, damage or repairs. All items are thoroughly and conservatively graded and all condition issues are noted; all items are vintage or antique and may have slight signs of gentle use. Expedited tracked insured shipping to the U.S. starts at $19 (other spots may vary) - insurance and tracking is included in all shipping quotes. Items paid with a credit card will be shipped to confirmed addresses only. We do ship internationally. All of our prices are in $US. PLEASE NOTE: we DO NOT accept PayPal, only VISA and MASTERCARD. 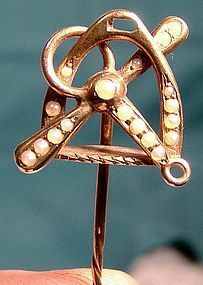 An Edwardian 9k rose gold mabe pearl bar pin circa 1900-1910. 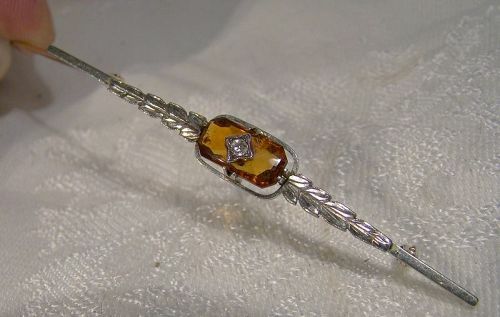 This simple and classy vintage Edwardian period 1-15/16" long bar pin features a 9 mm. claw-set mabe pearl; it has a modified c-clasp with a swing-up safety loop and it weighs 3.5 grams. It is stamped 9CT. with a W.J.F. maker's mark, and it is in excellent condition with no chips, cracks, dents, bends, corrosion, losses, damage or repairs. All items are thoroughly and conservatively graded and all condition issues are noted; all items are vintage or antique and may have slight signs of gentle use. Expedited tracked and insured parcel shipping to the U.S. starts at $21 (other spots may vary, air is higher). Items paid with a credit card will be shipped to confirmed addresses only. We do ship internationally. All of our prices are in $US. PLEASE NOTE: We DO NOT accept PayPal. 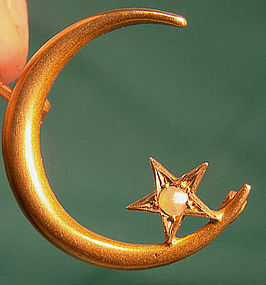 A vintage Edwardian moon and star honeymoon pin with a seed pearl c1900-10. 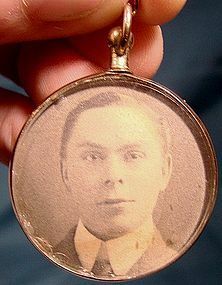 This 7/8" across pin has a c-clasp, it is stamped 14K with a key maker's mark, it weighs 1.7 grams, and it is in excellent original condition with no chips, cracks, dents, bends, corrosion, losses, damage or repairs. All items are thoroughly and conservatively graded and all condition issues are noted; all items are vintage or antique and may have slight signs of gentle use. Surface shipping to the continental U.S. starts at $6 (other spots may vary) - insured is higher, and mandatory on items over $85 if paid with a credit card. Items paid with a credit card will be shipped to confirmed addresses only. We do ship internationally. All of our prices are in $US. NOTE: we DO NOT accept PayPal. 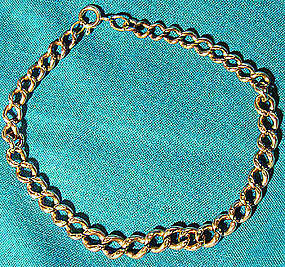 A 9k solid rose gold watch chain bracelet made from an antique English Albert watch chain. It has a modern spring-ring catch and each link is stamped 9 375. It weighs 13.8 grams, and it is 9" in length. It is in excellent vintage condition with no dents, bends, corrosion, losses, damage or repairs other than the replaced springring clasp. All items are thoroughly and conservatively graded and all condition issues are noted; all items are secondhand and may have slight signs of gentle use. Tracked expedited shipping to the U.S. starts at $27 (other spots may vary) - insurance and tracking are included in shipping quotes. Items paid with a credit card will be shipped to confirmed addresses only. We do ship internationally. All of our prices are in $US. PLEASE NOTE: we DO NOT accept PayPal, only VISA and MASTERCARD.